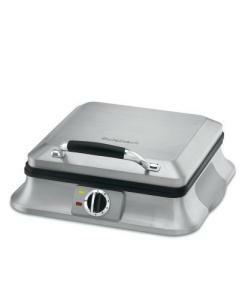 Another very popular item from Cuisinart, people applaud this device's audible tone which signals the waffles are ready. This frees you to move around the kitchen without fearing you'll miss the ready light. The iron also has indicator lights, should you prefer them, which signal when the iron is ready to cook and when the waffles are finished cooking. Waffles are best made to order and a trusty waffle iron lets you make them fresh and hot, browned just so, instead of relying on subpar frozen versions. This unit has six browning options operated through a precise regulating thermostat. The lid locks in place and won't rise during baking, keeping the heat and moisture inside (and locking the unit for storage later). Unlike the flip-over models, this design is simple, neat and self-reliant. The dependable unit makes four Belgian waffles with deep pockets and features nonstick baking plates. The Cuisinart has very few possible places for batter to become trapped, so it is a breeze to clean. It also keeps the counter clean because it has sloped sides to wrangle the batter. The plates wipe clean once you're finished. Helpful added features include non skid feet, a cord wrap and upright storage.